Donald Trump is doing really well in the polls. But he’s doing even better in the polls he tweets about. Trump did 3 percentage points worse, on average, than the Pollster aggregate the six times he bashed a poll. In all the polls he bashed, Trump fared worse than the Pollster aggregate. 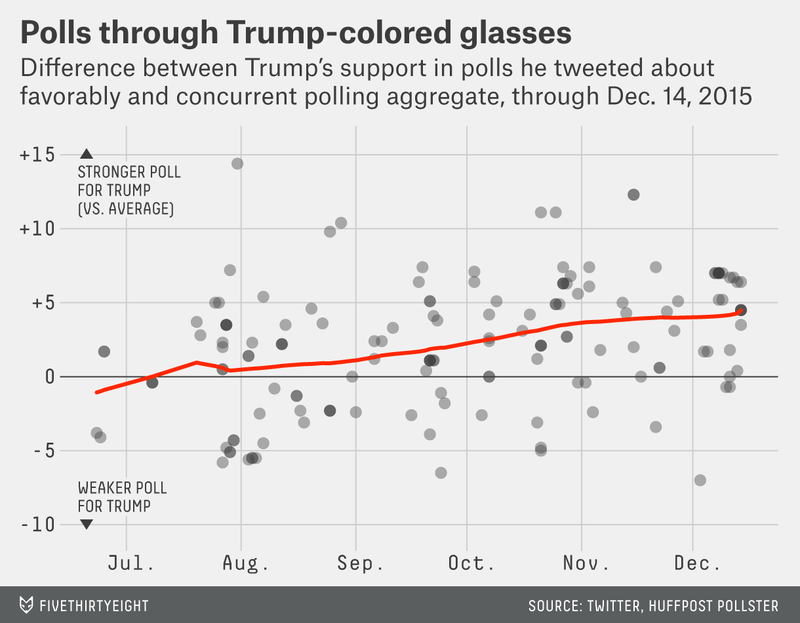 Trump’s poll-tweeting bias has grown over time. Through September, the average poll he tweeted approvingly was more favorable to him than the Pollster aggregate by less than a percentage point. Since October, the Trump tweet gap has risen to nearly 4 percentage points. Trump also likes to tweet or retweet about the same poll a lot. He tweeted 29 poll results that he approved of more than once. He also tweeted one poll (a September CNN national survey) favorably, before turning on it more than once to highlight a better poll result for him from NBC and SurveyMonkey. The @TODAYshow refused to use their just in poll numbers where I have a massive lead but instead used @CNN numbers where my lead is smaller. CNN is Trump’s favorite pollster, with its 28 references leading the 28 different pollsters whose results he has tweeted. The failing @nytimes does not mention the new @CNN Poll that has me leading Iowa by a massive 13 points – I am at 33%. Maggie Haberman, sad! As Trump’s polling has gotten better, his poll-related tweets have become more frequent: He has already made almost as many references to polls in tweets in December, halfway through the month, as he did in all of November. Trump is far from the only candidate to cite favorable numbers that are misleading. And there’s a good reason he’s tweeting polling numbers so often: Cherry-picked or not, they generally contain better news about Trump’s chances than about his opponents’. Check our our live coverage of the Republican debate. We isolated tweets containing “poll,” “pct,” “percent,” “point,” “%,” or “lead,” as well as derivations of those terms. That left us with nearly 600 tweets. We then selected those that referenced a poll or polls for which there was a HuffPost Pollster aggregate we could compare them to. Sometimes, a tweet contained references to multiple polls; sometimes, Trump tweeted the same poll more than once. We counted each mention of a poll in a tweet separately. To compare the poll and the aggregate, we used the level of Trump’s support. So if Trump tweeted a poll in which he got support from 20 percent of Iowa Republicans on a day when the Pollster aggregate for Iowa polls showed Trump getting 18 percent, that counted as Trump tweeting a result 2 percentage points better for himself. When there was no aggregate calculated for that date, we used the most recent aggregate as of that date. The finding that Trump is more likely to tweet a favorable poll than an unfavorable one is highly significant, with p<0.01.